Chocolate Eggplant? It sounds like a culinary joke or some newfangled fusion dish. In reality, melanzane al cioccolato is a perfectly orthodox if unusual dish from Campania, more specifically the Amalfi coast, traditionally made for the Ferragosto holiday on August 15. I have to admit, although I had heard of this dessert for years, I had my trepidations, and so might you. We are so used to thinking of eggplant as a vegetable that an eggplant dessert seems like an oxymoron. But eggplant, like the tomato, is a fruit, so the idea of napping it in chocolate is not as strange as it might seem at first. So why not give it a go? 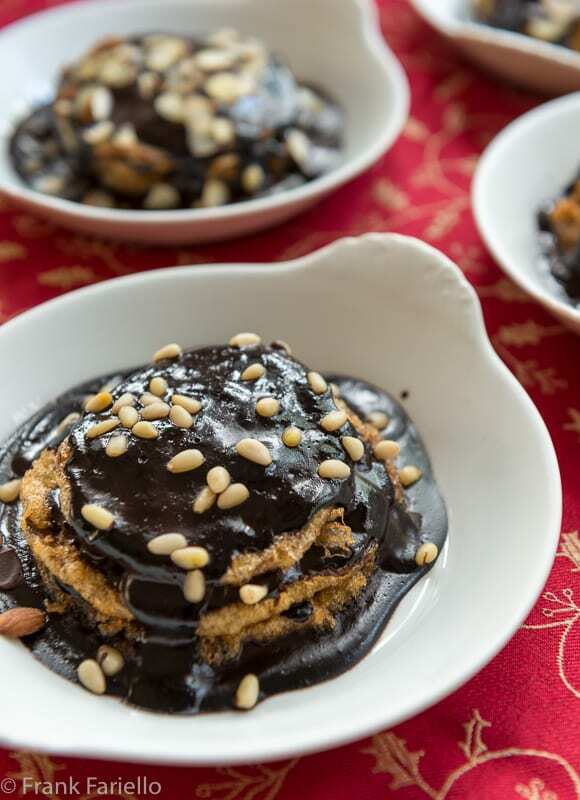 There are various ways to make this dish, but the basic recipe is constant: fried eggplant slices layered with chocolate sauce and sprinkled with nuts and candied fruits. The following recipe for melanzane al ciccolato is adapted from one in the iconic La cucina napoletana by Jeanne Caròla Francesconi. Her version caught my eye because, besides her stature as the doyenne of Neapolitan cookery, she made her melanzane al cioccolato the way Angelina made her parmigiana, dipping the eggplant slices in flour and egg before frying. But while Francesconi layers the eggplant slices in a baking dish as if she were making a savory parmigiana—the dish is also goes by the moniker parmigiana di melanzane al cioccolato—I prefer to make individual portions. The silky, mohogany-colored sauce, speckled with almonds or pine nuts, looks quite elegant napped over the golden brown rounds of eggplant. Fry the eggplant slices in batches in hot oil for just a minute or two on each side, until soft, taking care that they do not color. As they are done, lay them on paper towels to absorb the excess oil. When they have all cooled off entirely, dip each slice in flour, then in beaten egg, then fry them in the oil again, until golden brown. Once again, lay them out on paper towels or a baking rack to drain. While the eggplant slices are still warm, sprinkle them generously with a mixture of sugar, ground cinnamon and grated lemon zest. Make the chocolate sauce: In a saucepan, whisk together the cocoa, sugar and milk until smooth. Bring the mixture to the barest boil and let it simmer gently for a good 15-20 minutes, stirring from time to time, until the sauce is a dark brown and thick enough to coat a spoon. Prep the filling: While the sauce is simmering, mix together all the filling ingredients in a bowl. Rest: Let your Chocolate Eggplant rest until it is fully cooled before serving. It can also be served one or more days after you make it. Frying the eggplants twice may seem like overkill, but it’s a wise precaution against undercooking. A bit like French fries, the first frying serves just to soften the slices on the inside. The second frying produces the beautiful, crispy crust. Francesconi, like many other recipes, call for purging the eggplants under salt, but I find the fainty saltiness that lingers no matter how well you might try to rinse and dry the eggplant—off-putting. Anyway, these days eggplants rarely need it. Francesconi has you cut the eggplants lengthwise, but since I wanted to make individual portions, I cut them into rounds as you see in the photos. Francesconi also tells you to wait four or five days before eating the dish. I tried eating it as soon as it cooled, after a day, two days… up to five days. Yes, it changed over time, with the eggplant and chocolate melding more each day, but I rather liked it at each stage of the process, perhaps even better eaten right away or the day after than after several days. Most recipes for Chocolate Eggplant I’ve seen don’t call for coating the eggplant slices in flour and egg, but simply frying them as is. As with a savory Eggplant Parmesan, the result is a bit lighter but, to my mind, less interesting. Some recipes call for making the chocolate sauce with simple syrup rather than milk, into which you whisk cocoa and sometimes bits of bittersweet chocolate to intensify the chocolate flavor. Personally I find it a bit too sweet for my taste. Some recipes call for condensed milk rather than regular milk, in which case you should need less added sugar. Liqueur is sometimes added, too. In many recipes, the assembled dish is baked in a low oven for a few minutes, just long enough to help meld the flavors. The nuts are generally almonds, most often blanched—although personally I prefer the slight bitterness of almonds with their skins left on— and sometimes left whole. Pine nuts are not uncommon, either, and I’ve seen some recipes with pistachio or walnuts, too. Francesconi and some others add some crumbled amaretti to their filling. The origins of Chocolate Eggplant are a matter of some debate. Some say the sisters of the order Agostiniane di Santa Maria della Misericordia invented the dish. These prolific cooks are said to have come up with other famous Campanian desserts, including struffoli and mostaccioli. Others attribute the dish to local Franciscan monks at a monastery in Tramonti, still others maintain that it was brought to Italy by invading Saracens. The dish gained international celebrity when a visiting nephew of Tsar Nicholas II sampled it at the Grand Hotel Cocumella. It was after that the local bakeries took up the recipe for the general public. Assemble: When the sauce is ready, ladle a bit of the chocolate sauce on the bottom of individual serving plates. Lay a slice of fried eggplant on top. Sprinkle generously with the filling, then ladle of some of the chocolate sauce. Repeat with a second and, if you like, a third slice. Top the last slice with sauce and then more of the fruits and nuts mixture or, for a more uniform appearance, just the almonds or pinoli. You know, we Armenians preserve young eggplants in syrup. So I suppose eating it with chocolate as a dessert really isn’t so odd, after all. How interesting! I didn’t know that. I always wonder how recipes like this got started, I mean, what was going through the person’s mind who decided to pair eggplant with chocolate. In any case, I have to say, your photos are gorgeous. That deep color! It looks so intriguing. I’d definitely try it. Thanks, Jeff! The color is indeed striking. And I’m with you—can’t imagine who would have thought of this combination or how… but they did! This might be the most bizarre recipe that I have seen this month AND that I trust to be good. This is something I think I would try, but wouldn’t want to experience unless I was in Italy. When in Rome (or the Amalfi Coast)…. Now, I am remembering my trip to cinque terre. what fun. Thanks, Ben! Yes, it’s definitely “different”, lol! Just goes to show what human ingenuity can come up with. I wouldn’t try this in a restaurant here—although I doubt any restaurant would have to “cojones” to put it on the menu—but it’s worth trying at home. But then again, a trip to the Amalfi Coast is never a bad option.. Try as I might, I often find myself without any word to describe many Italian desserts other than “interesting.” I know it always sounds like an insult. It’s not. It’s just, well, “interesting”! l’ho fatta e pubblicata tanti anni fa , ricordo di averla mangiata con grandi aspettative perchè è un piatto della zona di mio papà. Non so se lui l’abbia mai mangiata a me non ha convinto molto, forse gustata in quei luoghi sarebbe stata più apprezzata, forse ho sbagliato io la ricetta , alla fine a fatica(dopo giorni) abbiamo finito la teglia , buon Ferragosto Frank ! Sicuramente non è un piatto che piace a tutti… 😉 Buon Ferragosto anche a te! Over the years I have read about this dish and explored a variety of recipes. I agree with you regarding salting of eggplant and the benefits of double frying. As always, I so enjoy reading your well documented posts – thank you Frank for another wonderful account steeped in tradition. I will admit to doing a double-take. Then a triple-take. I only got one eggplant from two plants this year (bunnies like eggplant stems) so I need to think – traditional or chocolate. Doubtful I could wait a few days after prepping though. This is indeed an intriguing dish and I’ve only ever seen eggplant prepared this way one other time from David Rocco’s “Dolce Vita” on the Food Network. I can’t imagine waiting a few days to sample this dish and would probably devour it on the same day. Buon Ferragosto! I’m assuming that was the Napoli series…? If so, it’s not surprising since he spends a lot of time on the Amalfi Coast, where this dish is from. It’s definitely a dish worth trying, at least once. Buon Ferragosto anche a te! Frank- I think you get the award for most unusual dish this week. Best crossover hit? Not sure what to call it. I have to say I have never heard of it and, if I find myself with some adventurous eaters – and for this, I think you really do need an adventurous palate – I will try it! Yes, it’s surely for adventurous eaters only, David. 😉 If you do try it, let us know what you think. It is definitely interesting! One of those dishes you either love or hate, I think… And it’s quite local, apparently, to the Amalfi Coast so perhaps that’s why you didn’t find it in Padula… Do let us know what you think! I’m using the Third Edition (1997). I haven’t made this, but when I make eggplant parmigiana I add a layer of cocoa powder about half way through layering. It adds a richness to the dish,and is really nice. My husband is from Torre del Greco and this is how his mother did it. Interesting note about adding cocoa to a savory parmigiana. That’s something I haven’t ever tried but it’s intriguing… ! I can’t imagine the flavor of this dish but I certainly would love to try it. Haven’t heard of this, and I certainly wouldn’t think of this combo of flavors, ever. Sounds pretty interesting, though, once I wrap my head around it. Neat dish — thanks. This is a fascinating recipe, even for an Italian. I should try it. Thanks for sharing. Buon Ferragosto Frank. Thanks for stopping by, Paola! Buon Ferragosto anche a te! This is a fascinating recipe. I open to trying new combinations of taste. I love eggplant and chocolate. They put chocolate in chili. They put balsamic vinegar over fruit. Why not?? Will tag you on Instagram when I make it. Thanks! It’s a combination that some people really like and others not so much… Let us know what you think! Surprised to see this combination, I must say; but will certainly give it a go ! Thank you Frank ! Enjoy the weekend ! Worth a try, guys. Thanks for stopping by! well done. I have been working on this recipe for some weeks now, researching and trying few versions. Most recipes are derived from Francesoni but for me the one that stands out is actually from Rosetta Costantino’s book on Southern Italy desserts. She fries the floured aubergine slices and coat them with the sugar, cinnamon and lemon mix. She then assemble the dessert adding, and this is the difference, a ricotta cream + chocolate ganache + almonds and other bits and pieces. Then the lot is baked. this is the only version I have seen where the eggplants are fried and baked. It is excellent – she said she tasted in a restaurant. I think I saw a similar recipe with a ricotta cream filling–not sure it was Rosetta’s or not— but opted for this more austere version to begin with. (Actually I began with the version where the eggplant is fried without flour or egg, which I found too austere…) Next time I’ll try Rosetta’s version.